What did we end up finding in Laos? Windy mountain death roads, crepes, and shakes. We spent hours and hours driving through mountain roads. There were constant hairpin turns that were causing other passengers in the van to throw up and we had to stop periodically to pour water on the brakes that were overheating from overuse… but we made it in one piece! The two highlights that we did get to enjoy while we were in Laos was the Kuang Si Waterfall and the Kuang Si Butterfly Park. 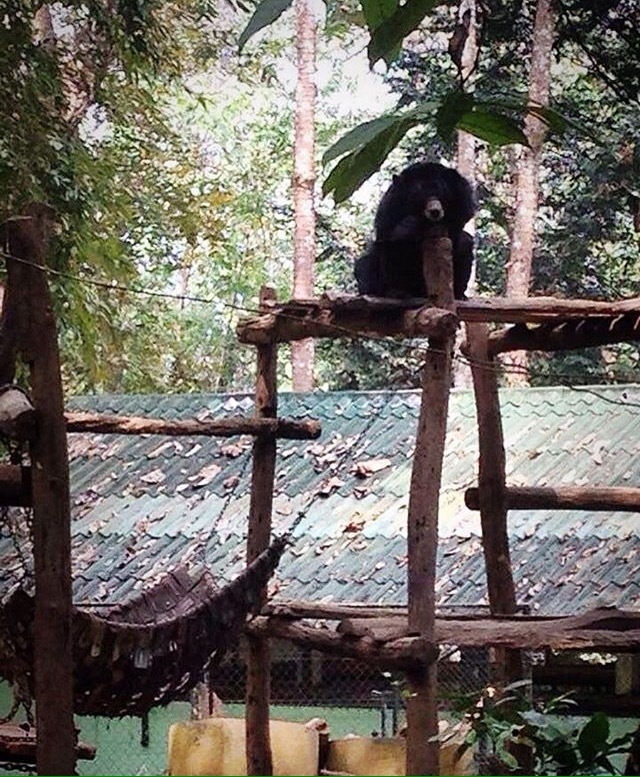 At Kuang Si Waterfall they have a Moon Bear rescue centre right at the entrance. You get to watch these big creatures lounge around in their enclosures. In Laos these bears are going extinct because they are killed for their gall bladders. The gall bladders are used for medicinal purposes so therefore the bears are in high demand and are still being poached despite having been protected for years. We rented a scooter from our hostel and took to the road to find the iconic Kuang Si falls. When we arrived at the waterfall, the bears were a pleasant surprise. When we arrived at the waterfall there was also a man handing our pamphlets for the butterfly park next door, at first we didn’t think much of it but in the end we did decide to check it out. It was worth the stop. The butterflies were beautiful and the entire park was lush and green, filled with flowers and other plants butterflies like. A neat thing about the park were the little springs that were naturally filled with nibble fish. These little fish eat away the dead skin from your feet and were commonly seen in tanks around Cambodia as a tourist attraction. I liked this opportunity much more because it was a natural pond, not a tank that has had hundreds of peoples feet in them. This was really neat… the fish didn’t hurt and I sat in a chair in the middle of the spring while they did their work. The butterfly park is a must stop for those travelling in Luang Prabang. I had never seen such an incredible waterfall. The water was electric blue and the infinity pools did not cease to amaze me as we passed by each one leading up to the giant falls. Landon and I climbed to the very top of the waterfall and got to enjoy the breathtaking view. On our way back down we took a little detour and found our own private spot in the caves at a lower level of the falls. The water was chilly but the privacy was worth it since this location is a tourist hot zone. If you have the chance, try to do the same thing and sneak away… doing so definitely enhanced our experience. Crepes and Shakes You Say? For some reason Laos just loves making crepes and fruit shakes. You will find a permanent night market structure selling both of these things. They are good… and were extremely unique to Laos. In the tent there are about 8 vendors all selling the same things. It does make you feel kinda awkward when you choose one ladies crepes over the other… I am not sure why they all sell the same things right beside each other but it seems to be a thing in Asia. I noticed this happening often with other items like sun glasses, shoes, wallets etc.. weird huh. We really didn’t spend much time in Laos at all but we did get to see a lot of it since we were travelling by bus for many hours. Laos was mountainous… very mountainous, green and was much more quieter than the bustling cities of Vietnam. I always felt like were were out in the country somewhere. Overall, I really enjoyed this country and it was a nice pass through as we ventured to Thailand. Thanks for the experience Laos!